Fantastic little life lessons. I also liked the chapter ending recipe. I dearly love this book. For the nature enthusiast, the chef, the fisherman, the poet and the curious, this book will educate, inspire, and delight you! I will be seeking out John Hersey's other books. It did take me quite a while to read this book. I would read one or two chapters at a time in between other books. There was nothing that had me so hooked that I had to read it straight through. At the same time, the episodic nature of it with the repeating pattern of its structure lent itself to this style of reading and I never put it away altogether.Every chapter of this book contains a general noise of conversation between the two characters leading up to a long speech by the fisherman weaving some web of ecology, philosophy, ethics; a general recipe for preparing fish at the end; and a poem between each chapter.They actually coalesce quite well. There is quite a bit of real knowledge included here (though some of it may be a little dated), and the language used to describe the ocean and fishing is beautiful. Allowing for a certain amount of pretension (the lack of names even after these people have been fishing together for months as one example of affectation), I enjoyed it. 3.5 Terrific content is, for me, marred by the presentation. The prose at first rubbed me entirely the wrong way, though did fairly quickly settle in to be enjoyable. I'm not sure what exactly I would have preferred here which might have conveyed similar information in a non-dry manner, but the unwavering structure of Plato-esque manufactured conversation, followed by recipe, followed by poem... fine intentions, just wasn't quite my thing. Were I to rate solely on content and intent, this'd be a 4.5. "Many men go fishing all of their lives without knowing that it is not fish they are after." ~Henry David ThoreauJohn Hersey reminds us of the circle of life within the ocean itself and within the scheme of our world as a whole. He also gives us some pretty sound fishing strategy and several very good and easy to prepare recipes for bluefish! An easy and worthwhile read - particularly for fishermen. I keep trying to read this. It's about fish. And fishing. And the art of fishing. And some other things. I'm sure it's very thoughtful and deep. I now understand that one kid in my comparative lit class who wrote an entire paper explaining why his reading assignment was like watching paint dry.Additionally, I keep reading the fisherman's words in the Pepperidge Farm guy's voice. This is probably not helping.I didn't rate this because I have. not. gotten. through it. A professional author and novice fisherman learns to fish, and at the same time the habits of the voracious schooling bluefish off of the New England coast. Each chapter begins with a recipe for bluefish. Interesting form, i.e. Hersey writes a conversation between a fisherman and a stranger, who initially criticizes the sport of fishing before trying it and finding he enjoys it. Along the way, the fisherman explains different ways of cooking fish and Hersey finishes chapters with fishing poetry. This is a hard book to rate. It is a treatise on fish and marine ecosystems, done in the style of a Plato type "conversation". It is loaded with facts about fish and fishing and includes recipes for cooking fish and poetry about fish. 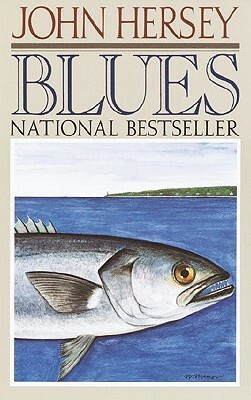 Blues by John Hershey (Knopf 1987)(799.11) is a series of essays on fishing for bluefish off Martha's Vineyard and the interaction of man, bluefish, and the ocean. My rating: 7.5/10, finished 2005. Somewhat slow and pedantic at times, but the immersion in the essence of fishing and the naturalism and conservation of the unique species called the bluefish makes for a good read. Possibly my favorite book of all time. I'm re-reading this, read it originally probably 10-15 years ago......fishing, poetry, biology, recipes...what else is there? A great read, so entertaining and infromative. Loved it AGAIN. hey! the description for this book is way way way way off! This is not a book about blues, it's a book about blue fish! I like the way it's written. I like the history and the life lessons-the actually fishing stuff I could do without......the recipes are cool! John Hersey - John Richard Hersey was a Pulitzer Prize-winning American writer and journalist considered one of the earliest practitioners of the so-called New Journalism, in which storytelling devices of the novel are fused with non-fiction reportage. Hersey's account of the aftermath of the atomic bomb dropped on Hiroshima, Japan, was adjudged the finest piece of journalism of the 20th century by a 36-member panel under the aegis of New York University's journalism department.